Having originally served in the military, she’s no stranger to the challenge of competitive sport or the tenacity you need to pursue your dreams. As the nation falls silent on Armistice Day, each and every one of us will be thinking of those individuals who gave their lives to the service of their country. For some, that silence is filled with a personal heart felt grief for the loss of a loved one. For many others, it’s a chance to come together and remember all those who made the ultimate sacrifice. TMM: How will you mark Remembrance this year? DKH: I’m actually abroad but I will be watching the BBC’s coverage to pay my respects. TMM: What does Remembrance mean to you? DKH: Having served in the military for nearly 10 years I really appreciate what all of the soldiers went through. TMM: Who or what do you think about during the two-minute silence? DKH: I’m thinking of all the people that fought and sacrificed their life. It’s important to remember those before us that helped to shape history. TMM: What inspired you to join the British Army aged 18? DKH: I wanted a memorable career, a chance to learn about myself and to meet other people. It is the best thing that could have ever happened to a younger me. TMM: What is your most memorable moment from your days in the military? DKH: I loved my days in the British Army especially the camaraderie by being a physical training instructor. TMM: What was the driving factor behind your decision to take part in ITV’s Mission to Survive with Bear Grylls and what did you learn from the experience? DKH: I thought it would be a great challenge, both physically and mentally. I learnt that I will always give something a go even if I am petrified as well as helping people deal with their insecurities even under pressure. TMM: What are your biggest success stories with the Dame Kelly Holmes Trust so far and how can our readers get involved? DKH: We have reached over 200,000 young people in the UK and have supported over 250 sports people transition or start to make a transition into other areas, post their sporting careers. Our objectives are to help young people from disadvantaged backgrounds get back in to education, training or employment. Through personal development programmes we believe we help change their lives for the better. 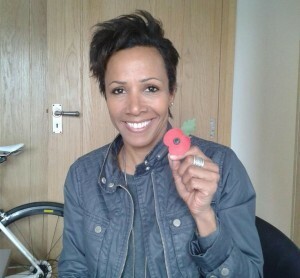 To learn more about the Dame Kelly Holmes Trust and how you can get involved, please go to www.damekellyholmestrust.org or tune into the BBC Lifeline Appeal on BBC1 on the 8th November at 1.45pm.